Rude Boy Train Radio 057 – Traditional Sounds ! 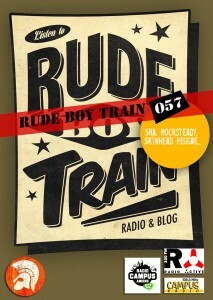 Rudeboys & Rudegirls… Rude Boy Train radio est de retour avec au programme du jour un retour aux sources vers la musique jamaïcaine des années 60 et du début des années 70… avec au programme Jimmy Cliff, The Slickers, The Paragons, Shark Wilson, The Pioneers, Keith & Tex, Alton Ellis, The Yard Brooms, The Maytals, Marcia Griffiths, Derrick Morgan, Heptones, Dandy Livingston, Claudette, Dave Barker And Ansel Collins, Nicky Thomas, Delroy Wilson, Tyrone Taylor, The Gladstone Band ! Playlist RBT057 – Traditional Sounds !
. Reel Big Fish : Don’t Stop Skankin’ (Intro).
. Jimmy Cliff : You’re The One I Need.
. The Slickers : Johnny Too Bad.
. The Paragons : The Tide is High.
. Shark Wilson : Make It Reggae.
. The Pioneers : Sha La La I Need You.
. Keith & Tex : This Is My Song.
. Alton Ellis : Girl I’ve Got a Date.
. The Yard Brooms : Every Day Will Be Like A Holiday.
. Marcia Griffiths : Feel Like Jumping.
. Derrick Morgan : Stand By Me.
. Heptones : Pretty Looks Isn’t All.
. Dandy Livingston : Rudy A Message To You.
. Claudette : Skinheads a Bash Them.
. Dave Barker And Ansel Collins : Monkey Spanner.
. Nicky Thomas : Love of the Common People.
. Delroy Wilson : Pretty Girl.
. Tyrone Taylor : Delilah.
. The Gladstone Band : I Shot The Sheriff.